In the Philippines, prayer is so intricately woven into the rituals of daily life and integral to almost all of its healing modalities: the "bulong" whispered in the course of a therapy, the "orasyon" written in varying sizes of cloth or paper and applied to the surface of the ailing parts, the use of the "anting-anting" and the St. Benedictine medallions with its daily recitations of prayers, the spiritual attributions of the faith healers, and the countless other prayerforms the ruralfolk use to invoke the Virgin Mary or their patron saints to intercede in their healing needs. 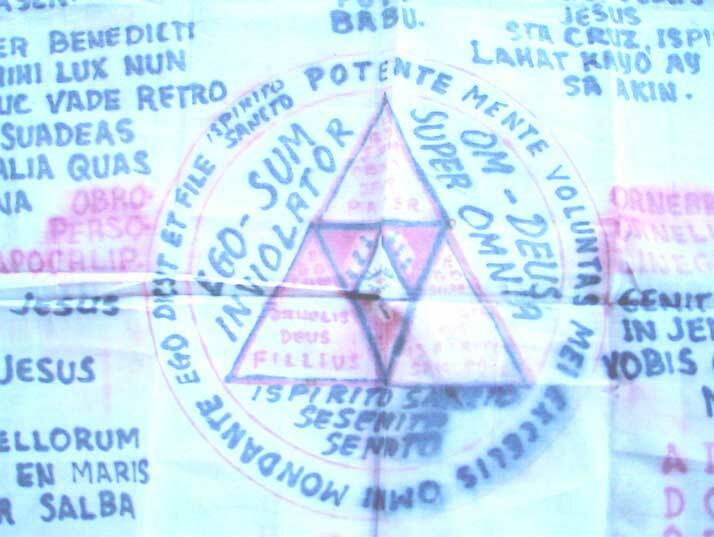 "Tiuyuy," an example of a prayerform, may be a piece of cloth (handkerchief) carried in person or clothing worn as an undergarment, to which prayers have been written on or whispered to, believed by the bearer or wearer to protect him or her from illness or physical danger. The hankerchief-sized prayer cloth (above) is detailed with numerous handwritten prayers. Arcane in its pig-latin or dog-latin, the prayers were written by a faith healer, and as such, believed to be empowered. The bearer has carried it in his wallet for the past 15 years, choosing and reading from the various prayers that have been assigned particular use according to the type of illness or severity of need. Like an "orasyon," the same prayers are often directly written on the surface of the ailing part.